Watching our daughters hunt for eggs Easter morning are some of my fondest memories as a father. But it always freaks me out to go into the grocery store around the Easter season. There is so much junk out there! Marketing Easter candy has become big business, and it’s really our children who lose. I think it’s easy to think “oh, just this once.” But that mentality has a lasting effect. Even “just this once” candy can alter our taste buds, making us crave worse foods in the following weeks and months. It’s these “just this once” holidays where children learn what’s normal and where they develop habits they keep for the rest of their lives. Sugary, refined carbohydrates also change the development of the bones and structure of our children’s faces and airways. The earlier children begin to have dental issues like cavities, the more complicated their oral health gets in adulthood. This all might sound very serious, but I promise this doesn’t have to put a damper on the Easter holiday. I have a sweet tooth myself and don’t think you have to sacrifice any of the fun just because you want to model moderation and healthy habits during the holidays. This is my guide for everything to know about Easter candy — the good, the bad, and the ugly, as well as healthy swaps you can make. You can minimize that acid attack by the bacteria by doing a few things when you eat candy. Eat candy with plenty of water. Water helps neutralize the acids produced by the bacteria. Swish vigorously with water afterward. This can help shake loose bits of sticky candy that get stuck in between teeth. When candy gets stuck in your teeth, those bacteria can have a heyday of a feast and continue excreting acid all day long until you get home to floss and brush that chunk out. Don’t snack all day. Eating a lot of candy all at once is better than spreading it out over days or weeks. If you’re going to expose your teeth to acid, do it for as little time as possible. Wait to brush. With all that acid in your mouth, you’ll want to wait to brush and floss for at least 30 minutes to one hour, depending on how much water you’ve had to neutralize the acid. Enamel is strong, but it wears away with acid, and brushing with all that acid in your mouth could easily wear away more enamel. Not all indulgences all created equally. 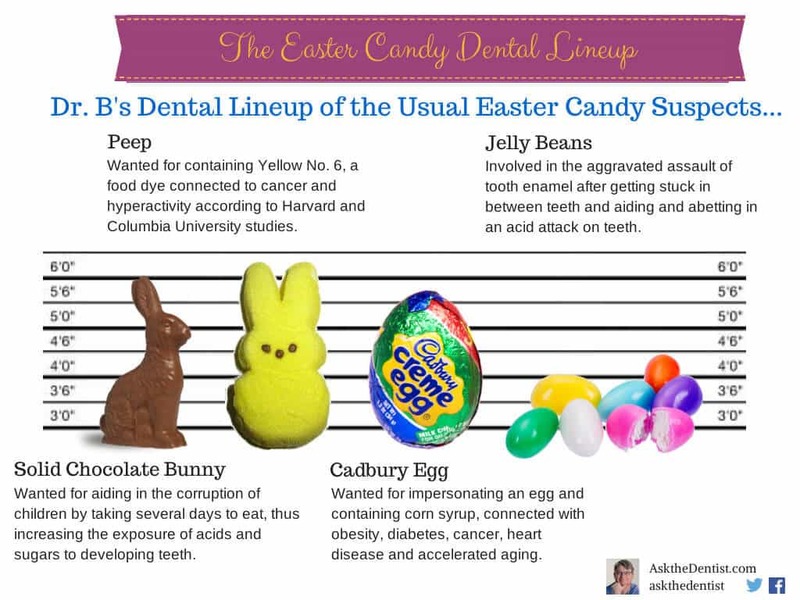 Here’s how Easter candy stacks up, from the best to the worst choices. Sticky candy: The stickier candies do more damage to teeth because they get stuck in the teeth — allowing the bacteria to feast and excrete acid all day long until you get home to brush or floss the gunk out of there. This includes dried fruit! Any candy that takes a long time to eat: The more you expose your teeth to sugars and acids, the more time the bacteria get to feast and excrete acids. Sucking on lollipops or a chocolate bunny all day does far more harm than eating the same amount of candy all in one quick sitting. Anything gummy: Gummy candies can be the most acidic, and acid is what damages the teeth. Dark chocolate: Chocolate is good for your teeth! Properties in chocolate have been proven to be better than fluoride at strengthening enamel. Just keep it to 75% and above. Raise your kids on this “bitter” chocolate so their taste buds learn the difference and can appreciate this high-quality chocolate. Candy bars with nuts: Nuts can break up the stickiness of a candy bar as well as break up some of the biofilm of the teeth. My favorite “candy bar” which I’ve found to be tastier than my old favorite Payday and extremely low in sugar — around 5 to 6 grams depending on the flavor — are the KIND bars. My favorite flavor is Dark Chocolate Nuts & Sea Salt. Homemade baked goods with monk fruit sweetener or coconut sugar: Both of these sugar alternatives have a low glycemic index and are less damaging to the teeth and body than sugar. To my surprise, they weren’t nearly as difficult to swap out for sugar in recipes as I thought. It’s frightening what’s allowed in candy, especially candy intended for children. These are the two most common and most harmful ingredients that you should know about and ban from your household. Yellow No. 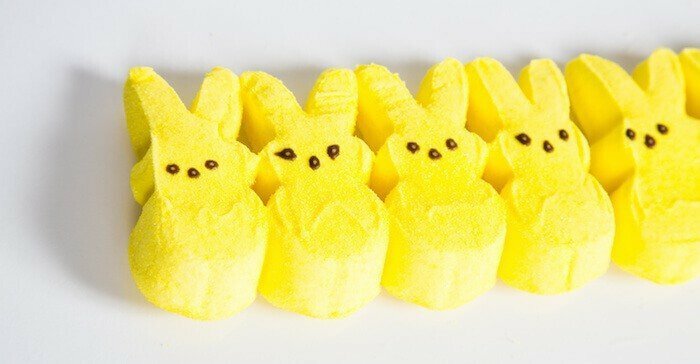 6: The food dye that makes Peeps yellow was found to cause ADHD symptoms in children. An analysis done by Harvard and Columbia Universities confirmed that removing Yellow No. 6 from children’s diets can relieve symptoms of ADHD. In the UK, foods containing Yellow No. 6 come with a warning that says “May have an adverse effect on activity and attention in children.” Some companies, like Kraft, have removed Yellow No. 6 from their mac and cheese to avoid having to show that warning label in those countries. Dried fruit: Once a fruit is dried, the naturally present sugars become extremely concentrated. Dried fruits act like sticky caramels in your mouth. Their stickiness clings to teeth just like candy and traps cavity-causing bacteria and sugars on the teeth. 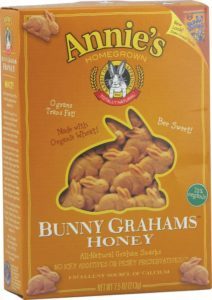 Annie’s bunnies: I love Annie’s as a company, but their bunny graham crackers are far from healthy alternatives to candy — in fact, they’re just as bad. A lot of people think, if it doesn’t have sugar, I’m safe. But the truth is crackers convert into acids just as readily as candy does, creating the same danger for teeth in your or your child’s mouth. These crackers also get stuck in the in teeth more easily than some candy, meaning the bacteria get to feast all day until you floss and brush out the goop. This is why I don’t recommend Goldfish, or any kind of white cracker, as healthy snacks for kids. For kids, I like to tell them that cavities come from bacteria “pooping” in your mouth. When you eat, so do they. Your oral bacteria love simple sugars like crackers, pretzels, candy — anything refined or coming from a package. When these bacteria have a feast, they excrete acid as a waste product. This acid is what etches away tooth enamel and gives you a cavity. Many people are shocked when I tell them that the #1 cavity-causing food isn’t candy — it’s the saltine cracker. Saltine crackers are a simple starch, meaning they convert to acid just as readily as candy does. 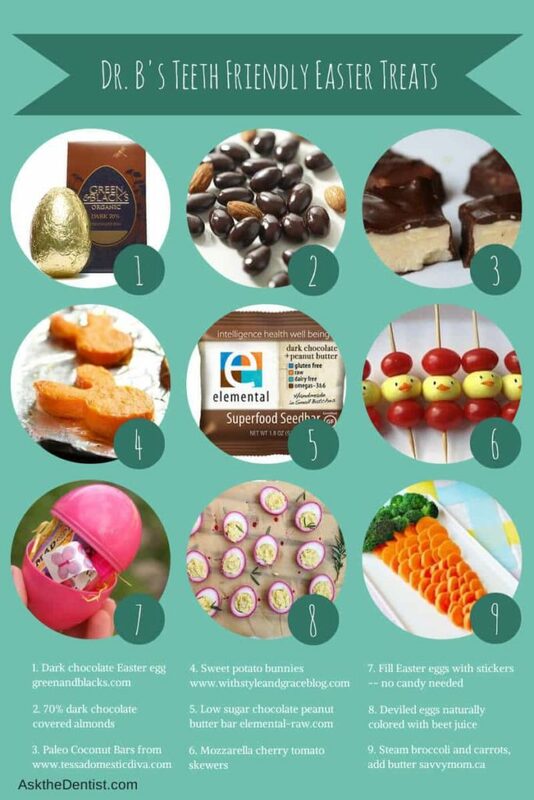 There are so many ways to enjoy your Easter with an indulgent treat. There are some of my favorites — let me know yours in the comments at the bottom of this post! Dark chocolate: Properties in dark chocolate have been shown by several studies to be better than fluoride at strengthening and remineralizing teeth. Green and Black’s makes an awesome dark chocolate egg for Easter that’s also organic. Monk fruit: Also called “lo han” sweetener, monk fruit is 300 times sweeter than sugar and is rich in antioxidants and anti-inflammatory properties. One study determined it had anti-cancer and anti-diabetic benefits. Like all sweeteners, beware not to over-use it to cause further sugar cravings. Look for pure lo han sweetener with no additives. Coconut sugar: I love baking with coconut sugar. It has a lower glycemic index (a measure of how quickly a food raises blood sugar levels) and slightly lower amounts of fructose. It also contains nutrients like zinc, iron, antioxidants, and inulin, which acts as a prebiotic. Real eggs: Boiling eggs and placing the focus on decorating them with natural dyes and stickers can still be enormous fun on the Easter holiday. Make them pasture-raised eggs for a healthy dose of Vitamin K2. Paleo coconut bars: This recipe for paleo coconut bars is super decadent and delicious. Sweet potato bunnies: In our house, we’re crazy for all things sweet potato, so we love these sweet potato bunnies. Low sugar chocolate peanut butter bar: Elemental Raw makes the most delicious, raw chocolate superfood seed bar I’ve ever found. I take these with me when mountain biking, skiing, or hiking. Broccoli and carrots: Believe it or not, kids (and adults!) are often craving something green after being surrounded by candy all day. This recipe keeps vegetables festive for the holiday. Slather them in healthy grass-fed butter (loaded with Vitamin K2) and your kids won’t complain about having vegetables.